Summary: Designing a home or work office can be complex with many things to consider. Here are some practical solutions that will help you get started. If you’re looking to design an effective and comfortable place to work and study, whether that be for work or school, there are certain aspects you’ll want to pay attention to. Here are some tips to get you started. Whether you’re working from home or in an office, the right lighting can make all the difference in your efficiency. Since many people work on computers now, working long hours can strain your eyes and vision, and the lighting above can only give you a bigger headache. 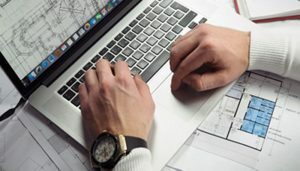 Implementing natural lighting in your office setting can decrease the amount of blue light emitted from computer screens and help mitigate headaches and eye strains. An underrated component of an office is a reliable Internet connection. While Wi-Fi is a viable option, it isn’t always reliable. There may be breaks in the connection which could affect your work and put a halt to online meetings. An Internet connection that consistently cuts out can interrupt your workflow and make it difficult to concentrate on the task at hand. A strong router can stabilize this so be sure to consider connecting an ethernet cable to your computer. Another key feature is including plenty of accessible outlets. Considering how screen usage has increase throughout the years, you need a way to charge your devices and plug in certain accessories like printers, monitors, routers, and more. Keep in mind that you’ll likely need a surge protector in order to handle the high amounts of voltage coming from these devices as well. Blog submitted by The Foam Factory: The Foam Factory is your cost-effective solution to camper cushions, mattresses, and more. Visit them online today for more information.